Malcolm Le Grice has produced a vast body of work since 1965 incorporating single-screen films, expanded cinematic performances and three-screen digital video works. Pieces such as Castle 1 (1966), Berlin Horse (1970), Horror Film (1971) and Threshold (1972) are canonical, but in the present era of 'digital aesthetics' there are other avenues of his work and biography that have become increasingly significant. Some of his earliest work involved video, multi-media and computer generated imagery and his use of different technologies has always influenced his understanding of film. Le Grice has adopted paradigms from a number of different media, the most significant of which is painting. Pieces such as Academic Still Life (1976) and Digital Still Life (1989) pay homage to Cézanne and Seurat respectively, deconstructing generic still life compositions through the exploration of movement, quick cutting and the manipulation of individual pixels. Le Grice could also be described as a 'colourist', but his use of colour has not been limited to one manner. Gross Fog (1973) creates abstract rhythmic patterns in colour. In many of his videos hues are subtly altered to heighten impressionistic values. In films such as Whitchurch Down (1972) bold coloured filters are used to flatten the illusory depth of a landscape. Relationships between abstract cinema and music have been of continued interest to Le Grice. He has collaborated with a number of musicians, the most significant of whom are Brian Eno and the seminal improvisation group AMM. 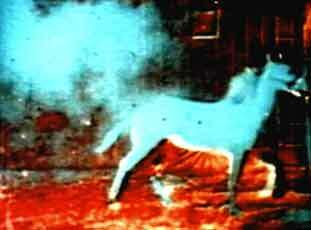 In films such as Berlin Horse and Threshold analogue tape-loop soundtracks mirror looping imagery. In videos such as Arbitrary Logic (1988), digital programming affects relationships between abstract colour patterns and musical tones. Even where musical structures are not obvious, Le Grice's editing is often related to an abstract score, or inspired by a frenetic jazzy improvisation. Le Grice's book Abstract Film and Beyond was published in 1977. In this and a number of other writings to date, he has been a formidable advocate of experimental cinema. Le Grice began teaching at St. Martin's School of Art almost directly after graduating from the Slade in 1965. In the subsequent academic posts that he has held and his various associations with BFI and Arts Council committees, he has continually helped to provide a practical context for experimental cinema in the UK. Le Grice helped to set up the developing and printing facilities at the London Filmmakers Co-op in the late 1960s and during the early part of his career, his central involvement in the Co-op provided a model for collective practice. At that time a significant difference between the English filmmakers and their American counterparts was the degree to which the latter were working much more independently and in what P. Adams Sitney saw as a 'visionary' tradition. In contrast, the more personal vision of Le Grice's later work brings him in some ways closer to Stan Brakhage, with whom he had at times vehemently disagreed.